Glory to Disgrace to Glory! Description of "TIGER WOODS (eBook)"
Tiger Woods' fall from global sports icon to tabloid fodder was stunning. He saw Accenture, AT&T and Pepsi drop him as a pitchman, but he remains the highest-paid athlete in the world thanks to huge deals with Nike, Electronic Arts and Upper Deck. Nike built a $650 million (sales) golf business from scratch on Woods' back. His fledgling golf course design business has been hurt by the economic downturn, as all three courses he's worked on have experienced major delays. But still, Tiger Woods tops the list of athletes in the Forbes-2010 annual ranking of the most powerful people in entertainment. His achievements to date rank him among the most successful golfers of all time. Currently the World No. 1, he was the highest-paid professional athlete in 2008, having earned an estimated $110 million from winnings and endorsements…and in 2009 his estimated annual earning was $105 million, even after his hardest period of personal and professional struggle. 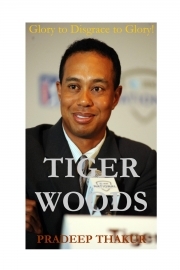 Reviews of "TIGER WOODS (eBook)"